When the weather turns great in your neck of the woods you probably will be heading outside to enjoy some meals outdoors. 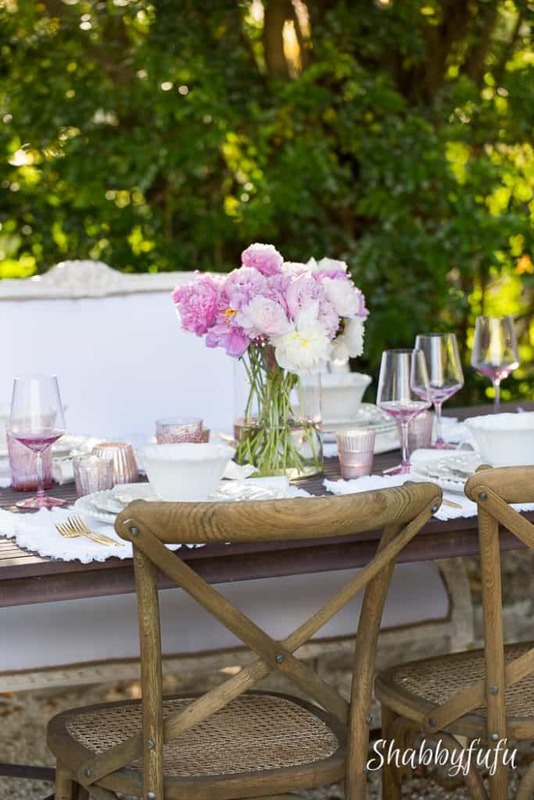 Dining al fresco is such a long standing tradition in the the bistros and cafes worldwide and here are a few tips that can help you create a beautiful party of your own. Start with the furniture, which may be obvious but if you have a choice I’d suggest seeing what isn’t too difficult to bring outdoors. We have been enjoying our pea gravel patio built under the shade of some trees and hope to be out here as much as possible this summer! The table is one that we have on our covered patio, but for larger gatherings my husband and I carry it to this area. One of my favorite special touches is to bring the inside out and mix and match our various indoor chairs around the table outdoors. The vintage French settee that normally sits in my modern French office is so perfect for Mother’s Day and it’s lightweight to cart around easily. 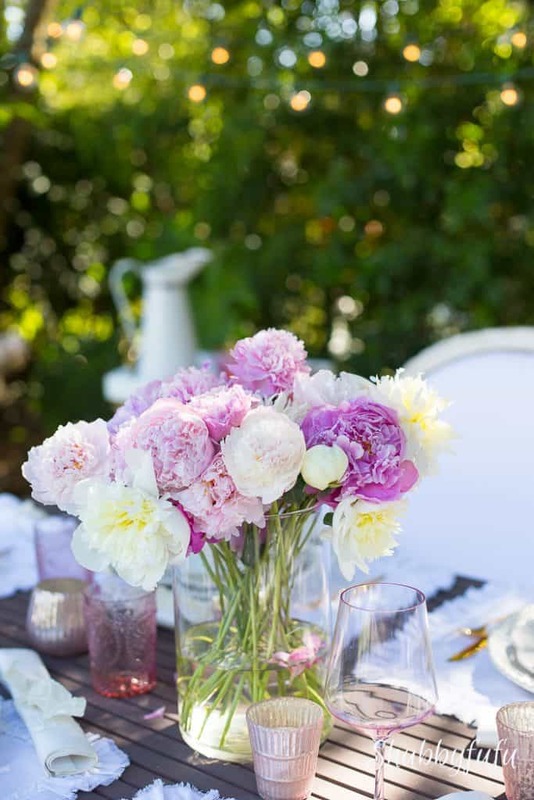 And pink peonies…the perfect floral centerpiece to celebrate mom or any special occasion. 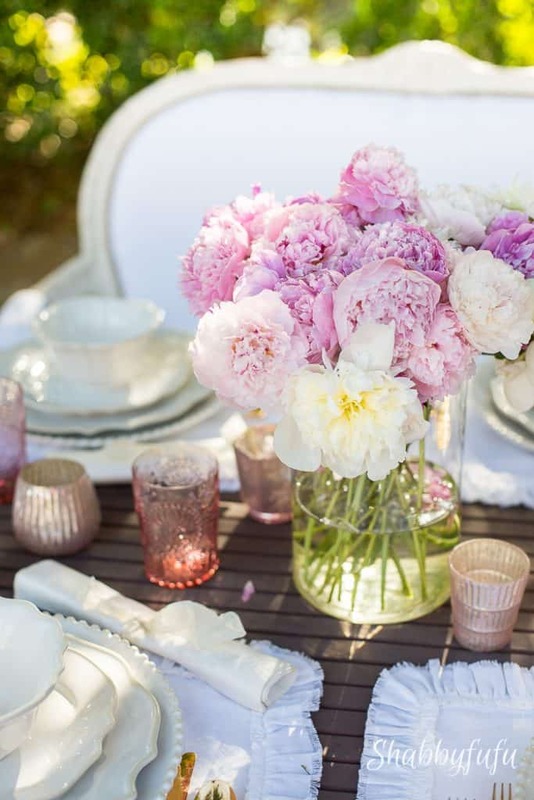 Peonies grouped together in a single vessel make the table utterly romantic! Does your mom (or you) love vintage? 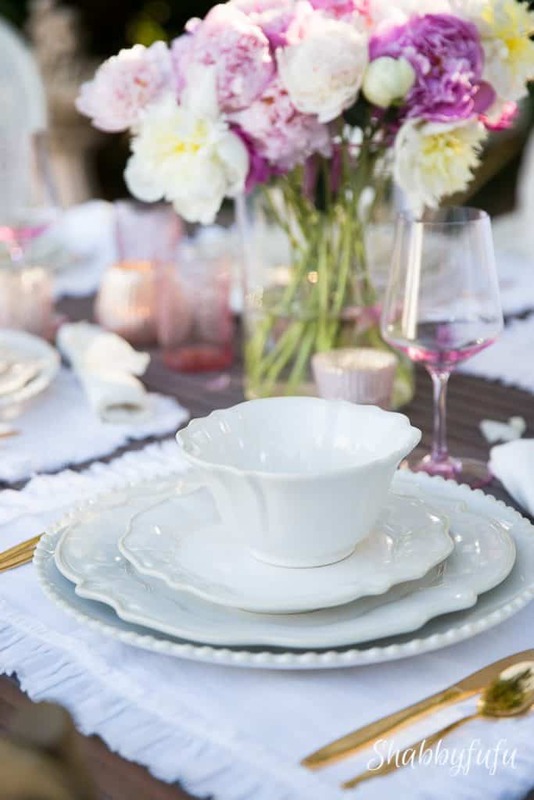 Mix and mingle some beautiful vintage items into the table and if it’s something that is a family heirloom all the better. 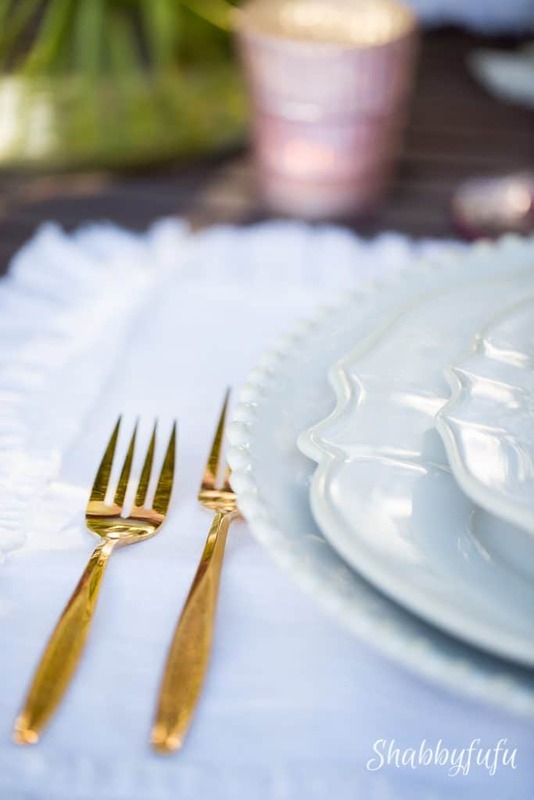 My gold flatware is vintage and I love the sparkle of the gold in the dappled sunlight outside. Set against all of the creamy whites it’s like jewelry. 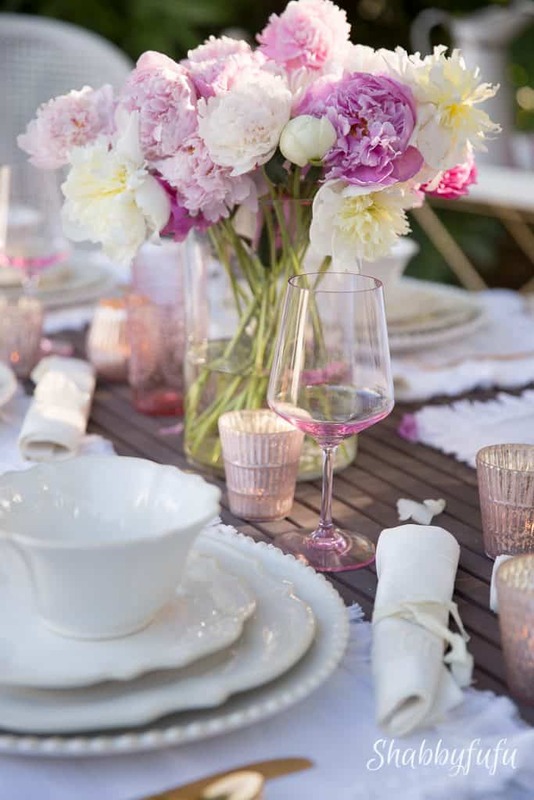 For Mothers Day dining, pink accents are so appropriate and some blush votives along with softly pink wine and water glasses look just right. Keeping all of the colors in similar tones and don’t go too overboard. 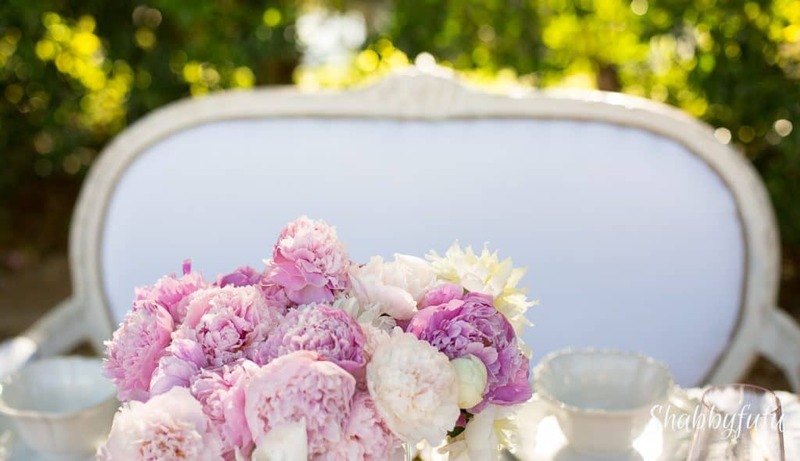 Ruffled linens are always in style and just add that special finishing touch to any tablescape. 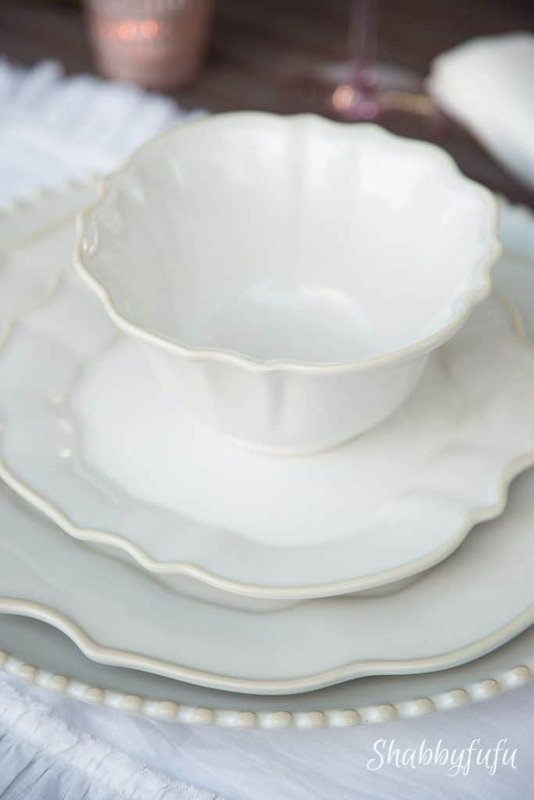 There is no color as perfect as white for warm weather entertaining and you can find white linens everywhere. Beautiful flowers and pretty dishes (thank you Amara) and let mom keep the florals! What are your plans for Mother’s Day?